In an Official press release, Universal Pictures announced to produce “Prime”, a romantic comedy starring Sandra Bullock and Meryl Streep, described as an “emotional love story set in New York about a 37-year-old career woman from the Upper East Side”. Visit their Press Release for more information. Congratulations. Meryl was announced Best Actress in a Television Movie or Mini-Series for “Angels in America” by the Screen Actor’s Guild. Receiving her award by Richard Chamberlain, Meryl also appeared on stage to introduce the “In Memoriam” segment. Al Pacino also won an acting award for “Angels”. Congratulations to Meryl for winning another Golden Globe Award. She was voted Best Actress in a Mini-Series or Movie made for Television for her performance in “Angels in America”. The big winner in the television categories, “Angels” scored a total of five Golden Globes, including Best Movie made for Television, Best Actor (Al Pacino), Best Actress (Meryl Streep) and the supporting performances by Jeffrey Whright and Mary-Louise Parker. Earlier on the show, Meryl also presented a Golden Globe to Tim Robbins in the Best Supporting Actor category. Meryl Streep has received a nomination as Best Female Actor in a Television Movie or Mini-Series for “Angels in America”. 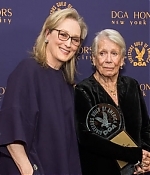 She shares this category with Anne Bancroft and Helen Mirren (both nominated for “Tennessee Williams’ The Romance Spring of Mrs. Stone”) and her fellow co-stars Emma Thompson and Mary-Louise Parker, who also catched nominations for “Angels”, which scored a total of six nominations. The Screen Actors Guild Awards air live on TNT on February 22, 2004. The first installment of the HBO miniseries “Angels in America” took 4.2 million viewers under its wings Sunday, making it the premium cable channel’s highest-rated movie this year. The three-hour block, which premiered at 8 p.m., drew an 8.6 household rating/12 share in HBO homes. “Angels” held up well over its running time, dipping only as low as an 8.1 at its lowest point of the evening. Report is courtesy Yahoo.